I fell in love with Inkheart when I read it more than three years ago. I thought it was a brilliant concept, and I loved the story. I called it a “book lovers book”, and gushed about the characters, the plot, the little quirks. I read Inkspell soon after, and I didn’t care for it as much. So, maybe I shouldn’t be surprised, three years later, that I was completely bored by the third in the trilogy. Now, perhaps this is because I waited so long in between reading the second and the third, and I didn’t bother re-reading the second again. But, I found myself unwilling to remember who all the characters were, and what their roles were, and how they fit into this very intricate world Funke has created. I also found that I’ve lost my original enthusiasm for the plot — which now seems very convoluted and hackneyed, not to mention more adult than is warranted in an upper-middle-grade book (even though my library has classified this one as teen). I didn’t care about Mo’s struggles with being a Robin-Hood-like outlaw. I didn’t care that Fenglio didn’t care, or that Elinor’s wallowing in depression because everyone’s gone to Inkworld without her. And so Meggie’s pining after Farid: what of it? She didn’t do much else (that I read). In addition, it’s a very slow — check that: excruciatingly slow — start; 150 pages in, I was thoroughly bored with the book. And so I did something I rarely do: I skipped around, looking for something more interesting to happen (spoiler: Dustfinger comes back. Woo-hoo! Except, he’s not nearly as intersting or complex), and when it didn’t — not really — I read the last 150 pages. Because, even though the book was overlong and painfully slow, I still wanted to know how their story ended. I guess I still care, if only a little tiny bit. I totally agree, Missy. It’s hard, though, I think to write a series, especially when the first book is so good. It creates high expectations, for good or ill. That’s part of the reason I’m not terribly fond of series. Too many ways to be let down. So far I’ve only read ‘Inkheart’ but I have, or my daughter does, part two on her shelf. We will definitely read it but I think we’ll pass on part three (at least I will, if she wants to continue, she’ll just read it on her own). I found this post so timely because I just finished Inkheart this week and absolutely LOVED it! I immediately started Inkspell and I must confess, I am not in love with it. I like it ok — and I will finish it, but it does not have the same magic as Inkheart.Thank you for your very honest review. 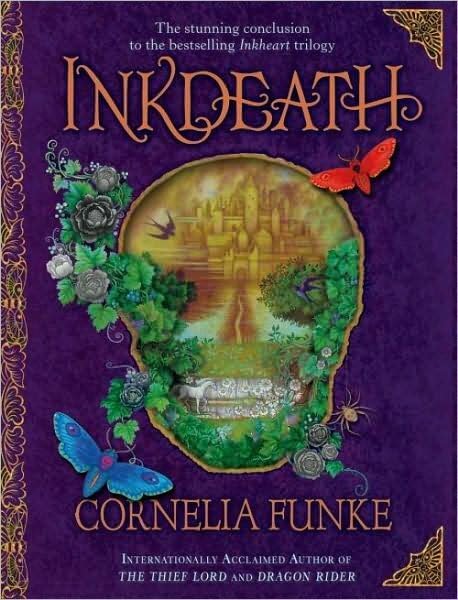 I think I will probably want to finish the trilogy at some point in time – but I will probably not feel the need to read Inkdeath immediately. I felt the same way about this book. I finished it, because I cared to know how everything turned out, but I was frustrated by the focus on adult characters, and the passivity of Meggie. Too bad, because I loved the first book, too. That happened to me with Robert Jordan’s Wheel of Time series at the beginning I fell in love with the characters, the storyline was brilliant but something happened and I quit caring about the characters…thanks for a very honest review!! I adored the premise of the books, but agree that there began to be too many confusing storylines and characters. It kind of lost its charm.